Enough Open XML and ODF battle for standards. The topic of "which is the better" apart, the bare truth is that many people have to deal with docx, xlsx and pptx files, willingly or unwillingly. Last night I got an xlsx file from my colleague at the last minute. By that time he had left for home. I was left with two options - surf the web for online Open XML converters or use that standalone OdfConverter (I extracted from one of the Novell's rpm). I choose the later with resulted in a shoddy conversion. These incidents happen on a regular basis. Somebody told me to use OpenOffice 3 Beta. I dropped that idea after all it is in BETA. Then I hit on this OxygenOffice. 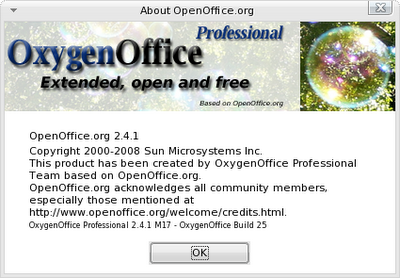 Its enhancements over OpenOffice (though it is based on OOo) seemed alluring. Of all the features I liked its support for importing MS Office 2007 Open XML files to native ODF. Downloading was damn easy. The full suite was just 292 MB. The real struggle was installing. Because it did not have any setup shell script (like the one's presents in OpenOffice tar.gz files). All it had were a RPMS directory and some, may be release notes or other unusable information. It had no instruction for installation! Then I removed some unnecessary rpms and tried that old formula "rpm -Uvih *.rpm" inside that RPMS directory containing packages. It ran for sometime than asked for Java Runtime. Dear me! I had removed those Sun Java packages from my Mandy notebook (But OOo did run without those JRE). Why did it ask for JRE? Trust me I have no use of JRE, it just takes some moments to run OOo. Anyways, I installed the Sun Java packages from Mandriva PowerPack DVD and issued that "rpm -Uvih" and it installed pretty well. Now the real trouble. When I started OxygenOffice writer, it entered to document recover. What a hell! I never worked on any documents before, and it was just first-run. Well, I okeyed the document recovery, strangely after recovery the OxygenOffice freezed right after the splash. Then after a little legging around I removed that .openoffice.org2 directory from my /home/user and rebooted the notebook. There was no such problem thereafter. But this experience of OxygenOffice made me think the program is anorexic. However, it is good to use it till the big release of OpenOffice 3. Mandriva 2008 is a big release in controversial ways. For mandy 2008 some people say it as the best release while many others deny. But I had a bad experience and I was waiting for my long beloved PCLinuxOS 2008. Why? Due to its problems in configuring Broadcom Corporation BCM94311MCG wlan mini-PCI (rev 02) that came with my compaq notebook. But good heavens, it's all resolved and I am in no hurry for PCLinuxOS 2008. Well, it will be a candid release when it will release. For now Mandriva 2008 is the best release for me. Let's go back to the problematic past. When I first installed Mandriva 2008 Powerpack at home I had no problem at all. It readily detected and configured my ethernet, graphics, sound and all that. The startup and shutdown also became blazing fast after shedding a little fat off installation. The real problem came at office when I had to connect either to Linkys WPA2 wlan or MTNL unsecure wlan. To my astonishment, though it shows it has bcm43xx module installed it did not move at all. Then I tried to connect to web via: mcc>>network & internet>>setup a new network interface>>wireless, it asked for a firmware file and i pointed it to my windows driver (bcmwl5.inf) it did configured. But unfortunately it took too long to shutdown and/startup the system after installing this firmware. There the problem did not end. After each reboot I had to reconfigure the wlan. Then I came to know from mandrivausers.org that actually support for some Broadcom wlan cards in Mandriva is not hassle-free, because the native bcm43xx driver does not work for this card but instead keeps interfering with the windows drivers (or any suitable driver that you pulled in). Anybody who is using Mandriva 2008 and having this broadcom card should follow these steps to get their wlan card working perfectly. That's it. Now you can breath easy. What Happened to PCLinuxOS 2008 and Red Hat Consumer Linux Desktop - Red Hat Global Desktop (RHGD)? We know Linux has enough potential to be a consumer desktop and we also know that Linux has less than 2% of desktop market share. Let's admit the truth. Linux enthusiasts may site a thousand reasons on why Linux does not sit on consumer desktops, or conversely why people are not ready to Linux even after Linux is absolutely ready. Let me put my experience. I have been using Linux since 2000 and I am proud of it. Of course, I had undergone a phase of agony while using Linux. The problems I faced (and still facing sometimes, despite using linux for last 8 years) were related to wireless, gadgets, drivers and application software. Everybody knows the modern linux kernel understands the system better than the aging windows xp (and vista). I have noticed PCLinuxOS 2008 manage the CPU, HDD and other devices of my notebook better than XP. But I still have to run Windows XP on another partition of my HDD. Reasons? I can't run Web CEO, Indicom Plug2Surf and Nokia GPRS internet connection on Linux. They run only on Windows. And it's an official compulsion that I have to use those software. Of course, at home I retreat to the safe abode of PCLinuxOS. Well, at this junction I had little hope on Red Hat Global Desktop. It had made news way back in 2007. And like any other Linux Enthusiast I was happy on that news. But the latest update is that Red Hat has dropped its consumer desktop! The reason as the Red Hat spokespersons say is, "The desktop market suffers from having one dominant vendor, and some people still perceive that today’s Linux desktops simply don’t provide a practical alternative. Of course, a growing number of technically savvy users and companies have discovered that today’s Linux desktop is indeed a practical alternative. Nevertheless, building a sustainable business around the Linux desktop is tough, and history is littered with example efforts that have either failed outright, are stalled or are run as charities." Having said all that, now all hope is on PCLinuxOS 2008 and Mepis 8. Hope they will solve the wireless problems of my Compaq C702TU. So far I have tried Mandriva 2008.1, Ubuntu Hardy Heron and OpenSuse 11. But I could not get desired performance from my Broadcom wireless chip. But it seems PCLinuxOS 2008 will take at least a month or two to appear, and, alash! there can no guess on the release Mepis 8. May be it will appear after an year from now.